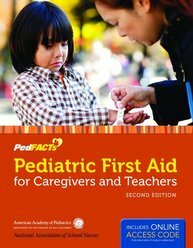 The Pediatric First Aid for Caregivers and Teachers (PedFACTs) course is designed to help those who care for young children provide pediatric first aid to a child who suddenly becomes ill or injured. All caregivers need to know how to manage minor injuries as well as what to do in emergency situations. In this course, the term caregivers is used to include child care providers, teachers, school nurses, relatives, and others who care for children. Usually first aid involves simple, commonsense procedures. First aid is intended to keep the child's medical condition from becoming worse. It does not take the place of proper medical treatment. In some situations, caregivers may need to provide first aid until emergency medical services (EMS), a medical provider, or the parent/guardian assumes responsibility for the child's medical care. Students in both course formats will attend class at a training facility for hands-on skill practice and skills evaluation. Both onsite and hybrid format students must bring their pretest certificates to the course classroom. Additionally, students in the hybrid course format must bring their final examination certificates to the course classroom to present to the instructor. For a concise overview of the onsite and hybrid formats of PedFACTs and an algorithm illustrating how to successfully complete course requirements and obtain a course completion certificate, click here. Please note, the individual access code is for students who need access to the PedFACTs pretest but do not already have an access code from their PedFACTs Participant Manual. A unique access code is located on a card in the front of every PedFACTs Participant Manual. If the silver foil is scratched off, then the access code has most likely already been used and is no longer valid. PedFACTs Instructor’s ToolKit CD: The Instructor’s ToolKit CD includes PowerPoint presentations, detailed lesson plans, course outlines, and more. PedFACTs DVD: This DVD provides detailed PedFACTs skills demonstrations that enhance the classroom learning experience for students and assist them through their own practical examinations. *To learn more about the PedFACTs course and how you can become an instructor, please visit: www.pedfactsonline.com. Purchase access to PedFACTs Online Pretest (Onsite Course). Purchase access to the PedFACTs Precourse Modules (Hybrid Course). These engaging, interactive online modules are completed by students in advance of the onsite course.